If you haven’t done so already this year, why not fire up the grill to celebrate the start of summer? Making an easy and delicious cedar plank salmon with spinach chimichurri is just the way to kick-off days filled with warmth and sunshine. Cooking fish on a wood plank is a foolproof, yet impressive way to prepare a meal. You get a wonderful, smoky flavor without the worry of your meal falling through the grate and it saves on mess and extra heat in the kitchen. Triple win! Simply soak the cedar wood plank in water for 1 to 2 hours, then pre-heat the grill to medium heat (~350 F). Lightly coat the deboned and deskinned fish with a bit of olive oil and place on the soaked plank. Then, set the plank directly on the grill. I prefer to use direct grilling since it produces the right amount of smolder to flavor your fish. By pre-soaking the plank, you shouldn’t have any issues with spontaneous flames, but keep a spray bottle of water handy just in case. Close the lid of the grill and let cook for 20-25 minutes, or until the salmon is cooked through. In the meantime, prepare the chimichurri sauce. Chimichurri is an Argentinean green sauce, typically consisting of parsley and garlic plus some spices, that is served with grilled meat. 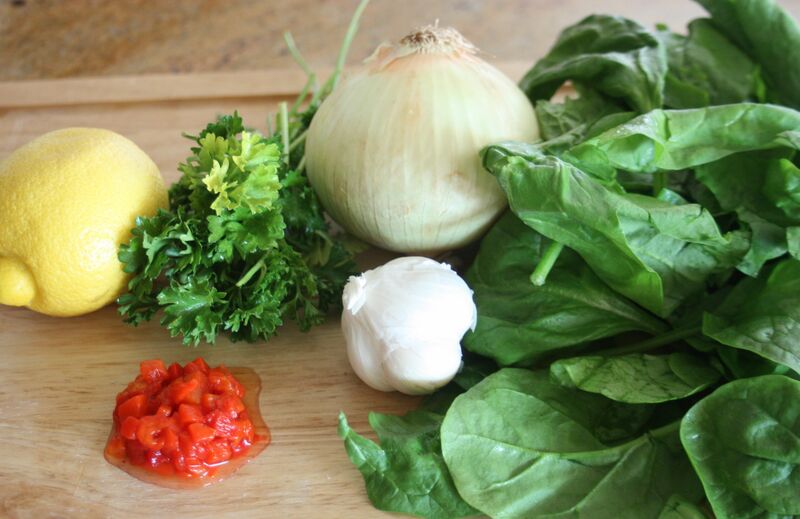 For this recipe, I decided to make spinach the main ingredient in my chimichurri, with pimentos, lemon zest, garlic, and parsley to round out the flavors. All the sauce ingredients get added to a food processor and blended until smooth – done! 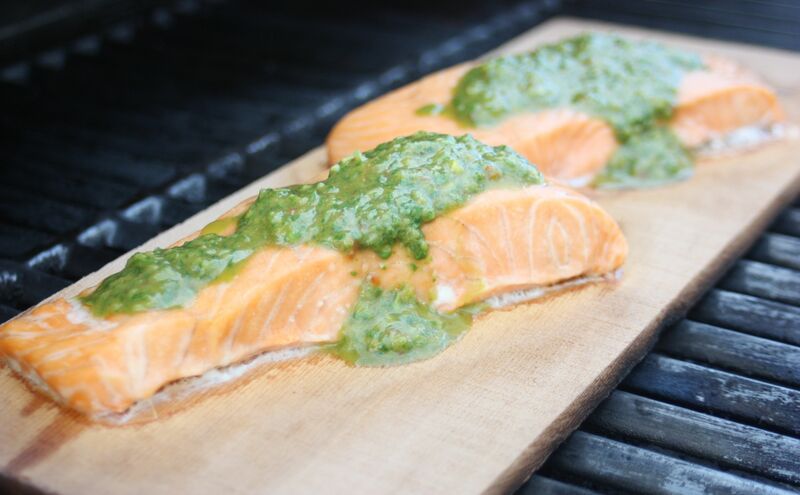 Once the salmon is cooked, remove from the plank and plate, topping with a generous amount of the chimichurri and serving with rice to soak up any of the extra sauce. 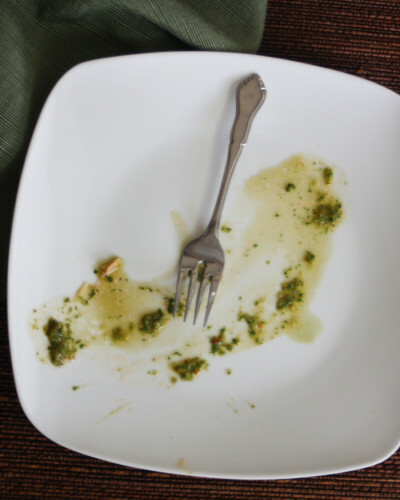 You will barely be able to keep yourself from licking the plate clean. Place the cedar plank in a large bowl of water and let soak for 1-2 hours. 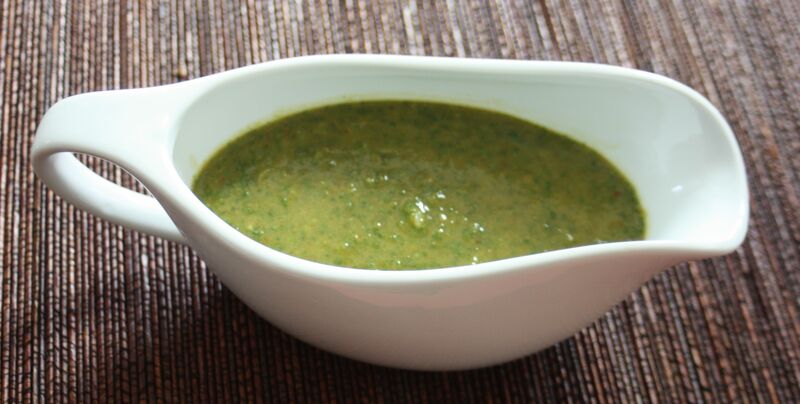 Puree all of the spinach, parsley, onion, pimento, garlic, oil and vinegar in a food processor until a smooth sauce is formed; transfer to a small bowl and stir in salt and pepper. Refrigerate until ready to serve; at least two hours. Once plank is well soaked, preheat a grill to medium heat. Lightly brush the salmon with olive oil, then place the salmon on the pre-soaked plank and place plank on grill. Cook for 20-25 minutes or until salmon is just cooked through. 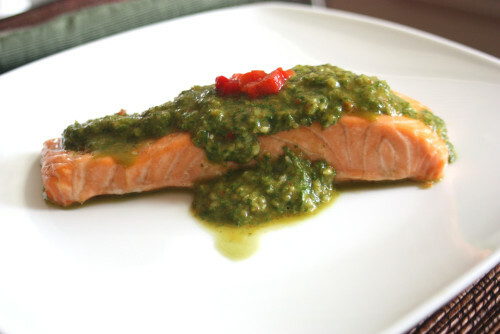 Remove salmon from grill, transfer to plate and drizzle with a generous amount of chimichurri. You should have plenty of extra chimichurri sauce – it is actually enough for about two more fillet, but I like to pour the extra sauce over my rice! This entry was posted in Entree and tagged plank, salmon, spinach.